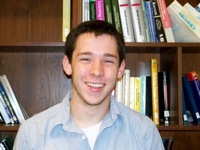 Junior Gregory S. Bentsen, student of Professor Frank Wolfs, has won a prestigius Barry M. Goldwater Scholarship. Endowed by the U.S. Congress to honor the late Sen. Barry M. Goldwater, the Scholarship is designed to provide a continuing source of highly qualified scientists, mathematicians, and engineers by awarding scholarships to college students who intend to pursue careers in these fields. Bentsen received a Phi Beta Kappa Iota Book Award in 2008 and the Honors Physics Prize in 2009. He is a Renaissance Scholar and also a Phi Beta Kappa Scholar. He currently has a GPA of 4.00, ranking him in the top 1% of the Class of 2011. He will graduate with a BS in Physics, a BA with Honors in Mathematics, and a Minor in ECE. In addition to his research for Professor Wolfs, Bentsen previously worked in the lab of Professor Doyley in the Department of Electrical and Computer Engineering. He is also a member of the Society of Physics Students. Since 2002, 21 University students have been named Goldwater Scholars. The scholarship is worth up to $7,500. Sophomore winners receive funding for two years, while junior winners receive funding for their senior year. Each year, 10 to 20 sophomores and juniors compete for the four University nominations to the national Goldwater competition. Applicants must rank in the top quartile of their class while demonstrating outstanding research skills and potential for advanced study in their fields as well as a strong commitment to pursuing research-oriented careers. The average grade point average of Goldwater Scholars is about 3.8 to 4.0 and most scholars go on to obtain doctorate degrees.